Good news Vita owners: Team 17 is working on a new version of its seminal strategy franchise Worms specifically for Sony's handheld. I've said it before, and only keep reiterating the point because it pains me on a very real, worryingly personal level: While Sony's Vita handheld is brilliantly designed and includes some very cool technology, the little gaming machine seems all but forgotten by developers - including Sony. I love my Vita to death, but there just aren't many enticing games on the system. Fortunately, a few developers have plans to change that, including one of my favorite firms, Team 17. You may not recognize that name, but chances are good that at some point in your life you've enjoyed at least one of the entries in their flagship series. 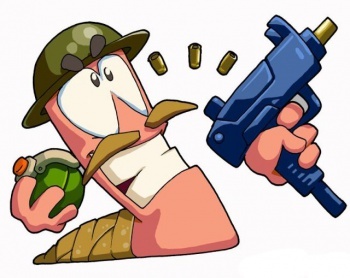 Worms as the name in no way suggests, is a violent strategy series centering on limbless invertebrates and their adorably hilarious attempts to blow one another to pieces using all kinds of imaginative weaponry. Yes, you have the standard bazookas and shotguns, but your worms can also drop Concrete Donkeys on one another or take out huge swaths of the landscape by lobbing the Holy Hand Grande of Antioch. Owing to its simplicity (most games in the Worms franchise only truly require two or three buttons), Worms has popped up on almost every gaming platform at one point or another. Later this year the Vita gets its turn, with a new title that Team 17 claims will be the "ultimate handheld" incarnation of the series. Speaking to the inexplicable gaming wing of Red Bull's official website, Team 17 managing director Debbie Bestwick explains why the company loves to work on mobile gaming platforms. "The format of Worms lends itself well to mobile devices," Bestwick states. "Last year we introduced asynchronous play to the iOS version of Worms 2: Armageddon, and the turn-by-turn play is extremely well suited to the gameplay of Worms, however we are always trying to improve the way it's played on touchscreen devices - it's an on-going process." Though unable or unwilling to offer specific details, Bestwick then drops hints on the next major version of Worms, the aforementioned Vita title. "One big Worms game we can mention is a game for the PS Vita that we are working closely with Sony on, this will be the ultimate handheld console version releasing later this year," she adds. So what does this mean exactly? That remains a mystery. I'm hoping it means that the Vita game will simply be a consolidation of all of the franchise's various 2D incarnations into a single, gigantic strategy game. I'm also hoping that Team 17 has learned its lesson about 3D Worms games, specifically that they don't work out all that well. Yes, the technology is there to make them look good, and it should be possible to translate the relatively simple Worms gameplay to the Z-axis, yet in practice the franchise falls apart when you remove its rudimentary 2D aesthetics. The sensation of playing a hyper-violent cartoon has always been a selling point for Worms, so here's hoping the upcoming Vita game will feature more of the same - much, much more of the same. Oh, and internet-based, asynchronous multiplayer. None of this ad-hoc nonsense that doesn't really work anywhere except in hyper-densely populated, tech-fetishizing countries like Japan. So far, there's scant information on this upcoming title beyond what Bestwick told Red Bull, but expect more info shortly.